Discovered in 1803 by W.H. Woollaston in London, England. Palladium is a member of the platinum group of metals. It is silvery white in color, is malleable and ductile, and is one of the most reactive in the group. It has an abundance of 6x10-6 in the earth's crust. Palladium has good corrosion resistance but is soluble in oxidising acids and fused alkalis. It readily absorbs hydrogen gas (up to 900 times its own volume), but its main use is as a catalyst for hydrogenation. Palladium is also used within the electronics industry and in some dental applications. 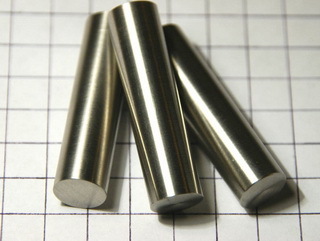 Diameter 0.5" - Length ~ 50mm. These solid and polished Palladium rods meet highest industrial standards and are best choice for elements collectors as well as for use in industry, jewellery, arts and crafts etc.